This study used a mixed-methods approach to investigate Iranian EFL learners' attitudes towards demotivating factors which may hinder their success in a language learning course. In the quantitative phase, a sample of 337 undergraduate students from universities in Mashhad, Yazd and Gonabad completed a 34-item questionnaire. They also completed open-ended questions which asked them to reflect on any previous EFL (English as a foreign language) learning experiences which had negatively affected their language learning motivation. In the qualitative phase, 15 students participated in semi-structured interviews, and 23 in focus group discussions. Quantitative data were subjected to principal component analysis (PCA), which subsequently revealed the presence of six demotivating factors, including lack of success, insufficient technological facilities, teacher's competence, teaching method and behaviour, lack of interest, class materials, and the class environment. Results of the study revealed that the qualitative findings were compatible with the factors that emerged from the quantitative phase. Among the many factors that are said to affect language learning is the concept of motivation, which can influence the rate and success of learning a foreign language. Dörnyei (2005) believed that motivation plays a critical role in the sustained process of mastering a language. Research has shown that motivation is one of the influential factors with regards to an individual's success in learning a language (Dörnyei, 2001a, 2001b; Gardner, 2000; Oxford & Shearin, 1994; Warden & Lin, 2000). Most of the research conducted in the area of motivation has focused on successful students at the expense of ignoring not-so-successful students (Tabatabaei & Molavi, 2012), which has left a gap in the research studies. In comparison to motivation, demotivation is a relatively less investigated research area in the field of second/foreign language context. Indeed, demotivation has been defined differently by different scholars. According to Dörnyei (1998, 2001a, 2005), demotivation refers to the certain external forces that will decrease or diminish the motivational basis of a behavioural intention or an ongoing action. These negative external factors could include ones such as the class environment, teaching situations, methods, teacher's behaviour, lack of interest, and experiences of failure, among others. To illustrate, studies have shown that some English language learners lose their interest and motivation during the English language learning process in some EFL (English as a foreign language) contexts such as in Japan and China (Ayako, 2004; Falout & Maruyama, 2004; Sakai and Kikuchi, 2009; Li & Zhou, 2013). Regarding the realm of language learning in Iran, English and Arabic are the two common foreign languages which are presently being taught at the school levels. Of the two languages, English has been recognised as the language of modernity, technology, and prestige, and has over years gained a higher status in this country in comparison to other languages (Pishghadam & Saboori, 2011). According to Mahboudi and Javdani (2012), English is situated at the interface of foreign and native cultures to a greater extent than any other language in Iran because of its increased use around the world and due to its being considered as a linguistic vehicle of the dominant twentieth-century culture. However, some Iranian students are less inclined to attend English classes at schools, which may inevitably result in their lower attainment of English language proficiency (Sharifzadeh & Heisey, 2010). In order to tackle this problem, researchers have quite recently started to investigate the demotivating factors within the Iranian educational system (Sharififar & Akbarzadeh, 2011; Hosseini & Jaffari, 2014; Mahmoudi & Amirkhiz, 2011; Tabatabaei & Molavi, 2012). Demotivation, sometimes called the dark side of motivation (Dörnyei & Ushioda, 2011; Falout, 2005; Sakai & Kikuchi, 2009) is considered as a crucial issue of concern in the realm of language learning (Dörnyei, 2001; Falout, 2005). It deserves specific attention due to its direct effect on pedagogy in general and on the learners' foreign language learning outcomes in particular. Unlike Dörnyei (2001a), however, many researchers do not agree that the underlying causes of demotivation are purely external. Some researchers (e.g., Arai, 2004; Falout & Maruyama, 2004; Tsuchiya, 2006a, 2006b) argue that internal learner factors including low self-confidence and negative attitudes towards the foreign language may affect students' demotivation (Sakai & Kikuchi, 2009). In an unpublished study (Dörnyei, 1998, as cited in Dörnyei, 2001a) on 50 secondary school students in Budapest, Dörnyei detected the main demotivating factors through structured interviews with participants who were identified by their teachers or peers as being demotivated. The nine emerged factors were (1) teachers' personality, commitment, competence and teaching methods; (2) inadequate school facilities; (3) reduced self-confidence; (4) negative attitude toward the foreign language studied; (5) compulsory nature of the foreign language study; (6) interference of another foreign language pupils were studying; (7) negative attitude toward the foreign language community; (8) attitudes of group members; and (9) the course book. Muhonen (2004) focused on demotivation in its own right, instead of viewing it as a constituent of motivation by specifying the demotivating factors, their frequency and order of significance, and their relation to gender as well as the school achievement. The participants were required to describe what demotivated their language learning desire. The emerged factors were the teacher (competence, teaching method); the learning materials (being unpleasant and boring); the learner's characteristics; the school atmosphere (building, resources and practices); and the learner's attitude toward the English language. Kikuchi & Sakai (2009) examined demotivating factors for students in Japanese public and private high schools by asking university students to reflect on their experience in high school. The salient demotivating factors were: (1) teachers' behaviour in the classroom; (2) grammar translation method applied; (3) tests/university entrance exam; (4) memorisation/ vocabulary centred nature of class; and (5) textbook/reference book. Many studies on demotivation have pointed to teachers as a major source and the primary cause of demotivation. In a study by Christophel and Gorham (1995), students mentioned that the leading cause of their demotivation was lack of teacher's interest and the ability to present. Arai (2004) reported that 47% of the attributed demotives were ascribed to the teachers' disagreeable personality and pedagogy. Oxford (1998, as cited in Dörnyei, 2001) traced teachers as the direct cause of the learners' demotivation towards material, and pedagogy and the textbook activities as the indirect affecting factor. Miyata, Shikano, Ishida, Okabe and Uchida (2004) reported that 53% of the total complaints of students were targeted at the teacher pedagogy and personality. The other 47% fell into the three most common categories: teacher-centred classes, translation-focused classes, and inconsiderate and less qualified teachers (Falout & Falout, 2005). Conversely, however, the results of some other studies downgrade the decisive role of teachers as demotivators. Sharififar and Akbarzadeh (2011) recognised classroom-related factors to be the most influential ones. Having done a principal factor analysis, Hosseini and Jafari (2014) came to know that inadequate school facilities, improper teaching materials and content, and absence of intrinsic motivation were among the major demotivating factors among Iranian secondary school students. Within the context of Iran, where English is being learnt as a lingua franca, demotivating factors appear to warrant more research. Different recent studies have been carried out during the past recent years, most of which aimed at recognising the leading sources of Iranian students' demotivation. Kavianpanah and Ghasemi (2011), for instance, in their study referred to five basic demotivating categories including learning content, materials and facilities, attitudes towards English speaking community, the teacher, experience of failure, and attitudes toward L2 learning. Likewise, Meshkat and Hassani (2012) indicated that lack of school facilities, over-emphasis on grammar, long passages, and the need to use grammatically correct sentences were the major causes of demotivation for the students. Tabatabaei and Molavi (2012) recognised improper teaching method, number of classes per week, problems in understanding listening material, and insufficient outside exposure to English as the most demotivating. In a similar vein, Farmand and Abdolmanafi Rokni (2014) concluded that failure to perform well, materials and learning equipment, contextual factors, teachers, class atmosphere, and attitudes towards communication were among the most salient demotivating causes for Iranian university students of EFL. While the body of research on demotivation in the Iranian context is not scant, the saliency of the issue warrants further studies to be conducted in different contexts and with different populations to help teachers and researchers to address demotivation within the Iranian language learning context. A sample of 15 first-year university students (6 males and 9 females) volunteered to be interviewed in order to specify the demotivating English language learning setbacks. Besides, 23 students (13 males and 10 females) participated in the focus group discussions to discuss the factors resulting in the language demotivation during the school years. In the quantitative phase, 337 English for Specific Purposes (ESP) university students comprising 114 (33.8%) males and 223 (66.2%) females participated to fill in the questionnaire and report their demotivating school experiences along with the other internal and external motivation decreasing factors in the attached open-ended form. They were from various fields of study, with ages ranging from 18 to 24 (mean age = 18.5 years). The respondents were studying at three public universities in Iran (Ferdowsi University of Mashhad, Yazd University, and Gonabad University), and had at least eight years of English study during their school years. In order to re-examine the emerged themes in the qualitative findings, the quantitative phase was conducted by administering Sakai and Kikuchi's (2009) demotivation questionnaire (Cronbach's alpha = .79), which consisted of 34 items in 5-point Likert-type questions ranging from 1(strongly disagree) to 7 (strongly agree). For the further intelligibility of the scale, it was piloted with 20 language learners and edited for content but not the structure of the questions. In order to identify the factors that caused students' demotivation in the EFL learning process, a variety of sources were used to collect data in the qualitative phase. Owing to the constructive role of qualitative research, semi-structured interviews, focus group discussions, and an open-ended form consisting of questions related to the external and internal factors leading to the EFL learning demotivation were applied for the qualitative data analysis. The present study was conducted over eight months from September 2015 to April 2016 to explore through a mixed-methods approach the demotivating factors that may affect studying English in the EFL context. The qualitative phase consisted of three instruments to ensure the validity of the data obtained: semi-structured interviews, focus group discussions, and an open ended form. During the interviews and focus group discussions, the participants and the researchers discussed the learning environments and the problems related to EFL learning. Saturation point was gained by 15 interviewees and 23 students during the discussion sessions who had either participated in the public school classes or had the experience of studying at the private language institutes as well, but still felt demotivated towards learning English. The focus group discussions were conducted during their class hours, each taking 20 minutes over three sessions (one hour total) in their mother tongue. After filling out the questionnaire in the quantitative phase, the students were asked to report their demotivating school experiences during English classes and mention the more likely factors that brought about demotivation, in an open-ended form which consisted of two items reflecting on the external and internal factors affecting the learners' demotivation. Importantly, all the participants took part in the study voluntarily and were interviewed in their native language (Persian). To ensure the confidentiality of the obtained information, all audio recordings and transcriptions contained pseudonyms that the students chose for use in the research findings section. For examining the number of the extracted themes in the qualitative phase, the quantitative analysis of the findings was conducted using Sakai and Kikuchi's (2009) demotivation questionnaire. It was a 5-point Likert-type scale comprising 34 items in Persian, taking about 15 minutes to be completed. In so doing, exploratory factor analysis (EFA) was undertaken to revalidate the scale, and detect the underlying constructs of the questionnaire and compare them with the emerged themes in the qualitative part. To achieve this end, Sakai and Kikuchi's (2009) demotivation scale was administered to 337 first-year university students who were taking ESP courses. The classes were held at three different public universities, each being taught by one of the researchers of the study in the autumn semester of 2015. Finally, SPSS (version 19) was used for the statistical analyses. The analyses of interview transcriptions, focus group discussions, and open-ended questions revealed six dominant demotivation-inducing themes. The themes were categorised into three subtypes of teacher's competence, student's competence, and educational context, each containing a number of subcategories (Table 1). The notion of lack of success emerged from 70% of the individuals' statements. It contained the subcategories of self-regulation, social capital, cultural capital, economic capital, and metacognitive strategies. Self-regulation and metacognitive strategies were among the most prominent mentioned features. In fact, I had a lot to do... the entrance exam, the ancillary classes, the tests, and so forth all were among the major causes of giving less priority to L2 learning. I had no idea how to study English... where to start, how to start, and what to read. Another said, "I cannot study English on my own. Someone should have told me what to do and how to learn." Reza had a similar opinion: "I could do well only when I was well directed. I still do not know how to study English." Ali also insisted on the same problem, "Really, how should we learn English? What should we study specifically? How long does it take? These questions are still left unanswered to me." I could understand English well, I kept making a program to study it on my own, however it was the only course for which I could not catch up with the program... Don't know really why but I guess I did not know how to study this lesson as it seemed different from other courses. Ahmad gave prominence to the role of social capital, "I had no one around who had learned English and could help me with it." I was the only person in the family who went to the language institute but could not do well compared to the others as I had no one around to help me more. I fell behind my friends whose siblings were of great source of encouragement to them and had full mastery of English. I loved learning English.... Uh... but I was alone. I desperately searched for someone with whom I could communicate.... Someone who could help me and correct me. It is really frustrating to attempt learning English in an illiterate family as my parents cannot only make sense of learning a new language but also are strongly biased towards learning any language rather than my mother tongue. I was really interested in studying English, however, I could not afford the language institute expenses. You know ....though I was doing well, I could not catch up with my classmates who took part in the language institute classes. This really affected my motivation when I compared my progress to my classmates... I felt I was lagging behind and indeed... uh... I was. Reza said, "I wish I could afford the language classes." Another frequently mentioned related factor to lack of success was lack of metacognitive strategies. Sara said, "I did not know how to manage my program as I was stressed with the entrance exam." Another learner stated, "It was really hard to make time for learning English." Learning English was a time consuming process which required further time management. I could hardly make arrangements for it as I had no idea how much time had to be devoted to each skill specifically. I was not at all interested in language learning. Uh.... Learning English at schools was only limited to memorising a long list of English words with their Persian equivalents which would surely fade away shortly afterwards. You know .... The point was that we were only memorising and not learning anything as we could not use the words in sentences for communicative purposes.... It was extremely boring and frustrating. I felt depressed and uninterested in English classes as I was always compared to my classmates who were actively participating in language classes. Surely, uh .... I could not catch up with them. I did my best but I was not seen in their presence. Why did I have to study English when I was unaware of the essential role of English in my future life... The truth is.... uh... I did not realise how important it was... and was not studying it purposefully at all. The teachers were not motivated by themselves to teach let alone to encouraging the poor students... hum... they were not at all interested in teaching English, in updating themselves, and using more various creative methods ... instead, they were teaching the same old grind in an unenthusiastic manner. Unfortunately, we had either novice incompetent English teachers or more experienced, yet, not motivated and committed language teachers. Some were really intolerant of our mistakes as they got promptly exasperated and impatient. I was scared of my teacher as she did not have the nerves and treated our mistakes as harshly as possible while being negligent of all our progress and efforts... we were not only appreciated but also damn scorned. I still don't like English though I am quite aware of the necessity of learning it as an international language. The point is that I really gained nothing in the boring school classes where we had either to translate or to memorise a bunch of words with their translation. I can hardly produce one single correct sentence after seven successive years of learning it. I wish we were taught with a more communicative and practical method. We were living in the age of technology while we were deprived of the least academic facilities including films, podcasts, and so forth in the school language classes. I needed much more excitement, fascination, and more importantly up to date materials. No matter how good we were in English, we would have been demotivated in school classes as we were not permitted to use our cell phones, laptops or any other gadgets in these classes. No English software was used in classes, no films, no cassettes, Huh..."
I guess I did not like the school books compared to the institute's fascinating native textbooks. Black and white books with no CDs... I could not absorb in the outdated readings and impractical subjects from which I gained nothing. You know... I guess we needed much more eye opening and insightful materials. I was not into those black and white books. The subjects were uninteresting...not practical at all to teach you how to speak English at various situations. I knew English words but could not put them into sentences as we were not taught to use the words in real life situations within a sentence. We were just memorising a long list of vocabularies each session. You know there were major differences between the school and the institute classes.... At the institute we had a lot of pair works and group works which really made English enjoyable but at school I always felt passive as the teacher had all the authority... there was no communication in English. There was no chance of communication in school classes... Sometimes we were hardly given a chance to talk as there were too many students in the class... we only had the opportunity of passing this course during the high school years with a few English teachers as there were only two... we needed much more variety regarding the teachers, the books, and so forth. The reliability of the whole scale was estimated as .79. Moreover, the estimated Cronbach alpha revealed that all the factors yielded an acceptable reliability ranging from .50 to .86 (Table 2). The items of the demotivation scale (Sakai & Kikiuchi, 2009) were subjected to principal components analysis (PCA) using SPSS version 19. Prior to performing PCA, the suitability of data for factor analysis was assessed. 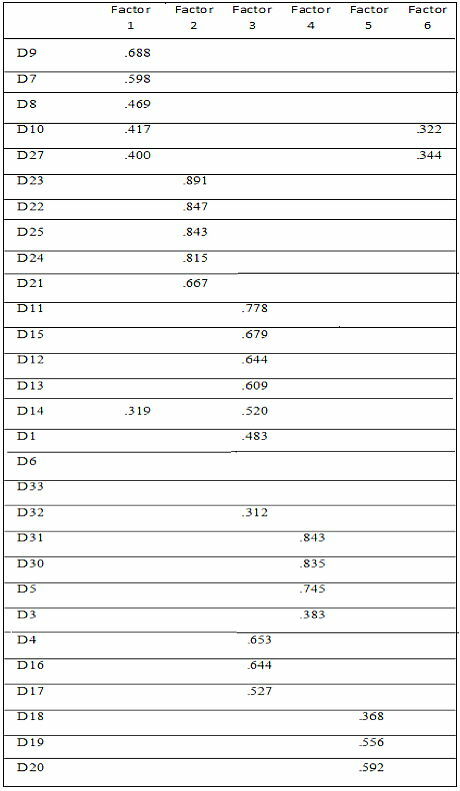 Inspection of the correlation matrix revealed the presence of coefficients of .3 and above. The Kaiser-Meyer-Olkin value was .78, exceeding the recommended value of .6 (Kaiser, 1970) and Bartlett's test of sphericity (Bartlett, 1954) reached statistical significance, supporting the factorability of the correlation matrix. Principal components analysis revealed the presence of ten components with eigenvalues exceeding 1, explaining 15.25%, 10.32%, 7.17%, 5.19%, 4.67%, 4.39%, 3.56%, 3.44%, 3.23%, and 3.12% of the variance respectively; however, an inspection of the scree plot did not clearly support a ten factor solution. In fact, the scree plot cutoff is quite subjective (Fabrigar, Wegener, MacCallum & Strahan, 1999) and this leads to the problem of detecting the exact cutoff point and over extraction of factors (Henson & Roberts, 2006). Henceforth, depending on the parallel analysis as the most accurate method (Pallant, 2011), it was decided to retain six fixed factors for the further inquiry. As a result, there were only six components with eigenvalues exceeding the corresponding criterion values for a randomly generated data matrix of the same size (34 variables ? 337 respondents). In all, the six-component solution explained a total of 47.01% of the variance. Besides, to aid in the interpretation of these six components, orthogonal rotation was performed. The rotated solution revealed the absence of simple structure (Thurstone, 1947) with variables that loaded on more than one factor (Table 3). As Table 3 demonstrates, although four items are cross-loading, two items (items 27 and 20) should be retained in as the cross-loadings on both factors are not greater than .40 (Schonorock-Adema, Heijne-Penninga, van Hell & Cohen-Schotanus, 2009). Therefore, items 10 and 14 should be discarded from the scale as they seem not to respond to the Iranian EFL context. Moreover, item 2 was removed from the set as it did not possess a significant loading on any of the factors. Taking together, the six extracted factors were in line with the frequently emerged themes. The first emerged factor was lack of success. Four items were loaded on this factor with loadings ranging from .40 to .68 (explained variance of 15.25%). The top item within the factor was "I did not know how to study English" (loading .68). This factor consisted of characteristics such as gaining low scores on English tests, having difficulty memorising English words and sentences, not being an autonomous and self-regulated learner, and falling behind their classmates in exams. Technology was the second factor having five items with the loading range of .66 to .89 (explained variance of 10.32%). The highest loading was on item 23 "The Internet was not used in classes" (loading .89). Factor 2 highlighted the role of modern technology and insufficient school facilities, such as no use of computers, films, CDs, Internet, and audio-visual materials, as the main demotivating factors. The third extracted component was teacher's competence and the teaching methodology with nine factors loading from .31 to .77 (explained variance of 7.17%). Item 11 "Teacher's pronunciation of English was poor" had the highest loading. Factor 3 contained characteristics including lack of L2 communication, teaching through grammar translation methods, the preponderance of accuracy over fluency, rote learning, entrance exam oriented classes, teachers' lack of competence, teacher centred classes, and the teacher's behaviour. Lack of interest was another emerged factor. Four items were loading on this factor with loadings ranging from .38 to .84 (explained variance of 5.19 %).The highest loading was on item 33, "I was not motivated to learn speaking English" (loading .84). This factor underlined the significant effect of interest, internal motivation, and using a non-communicative method. The fifth emerged construct was the classroom materials with six factors loading from .36 to .59 (explained variance of 4.67 %). Item 18 "English sentences dealt with in the lessons were difficult to understand" had the highest loading of .59. This factor consisted of uninteresting reading topics, long passages, difficult writing style, numerous assigned textbooks, outdated materials, and unavailable key answers. Finally, class environment and characteristics was the last extracted factor having three items loading from .55 to .64 (explained variance of 4.39%). The highest loading was on item 29 "I was mostly compared with my classmates in the English classes" (loading .64). This factor stressed the impact of the number of students in the class along with the role of classmates and how they were treated unevenly by the teacher. In summary, the results suggest the quantitative findings are compatible with the qualitative reported factors, which seem to be indicative of the high importance of the role of the emerged factors in contributing to the extent of student demotivation. As was mentioned in the previous section, a total of six factors emerged as leading to learner demotivation in the Iranian educational context. These factors were lack of success, technological factors, teacher's competence and the teaching methodology, lack of interest, the classroom material, and the class environment and characteristics. According to Dörnyei and Ushioda (2011), motivation includes factors such as the attached value of a task, the rate of success expected by the learners, learners' beliefs with regards to their competence to succeed, and what they believe to be the reason for their success or failure at the task. Dörnyei (1998, 2001a, 2005) considered lack of success or rather experiences of failure to be a negative external factor. Furthermore, Mahbudi and Hosseini's (2014) study conducted in Iran indicated failure to succeed as one of the major demotivating factors. The current study also specified lack of success as one of the major demotivating factors which consists of other characteristics such as low grades, difficulty in memorising, being dependent or non-autonomous, and other-regulated learners and the inability to keep up with classmates in exams. Even though Dörnyei (1998, 2001a, 2005) considered lack of success to be a negative external factor, the current study indicates that this factor is not necessarily an external factor, but also it could be an internal factor as results show that one of the characteristics of this factor is being dependent and other regulated learners. Dependence and reliance on others implies that the learners are unable to be autonomous due to their own internal personal characteristics such as low self-confidence and low self-esteem. With regards to the second demotivating factor, namely technology, the current study signifies the importance of using technological facilities such as computers, films, CDs, the Internet, and audio-visual materials. As previously mentioned, Dörnyei (2001a) found that one of the areas of concern regarding demotivation is inadequate school facilities. Similarly, a few other studies indicated school resources, facilities and learning equipment or the lack of these as one of the major demotivating factors (Sharififar & Akbarzadeh, 2011; Arefinezhad & Golaghaei, 2014; Farmand & Abdolmanafi Rokni, 2012; Kavianpanah & Ghasemi, 2011; Meshkat & Hassani, 2012; Muhonen, 2004). These studies and the current study show that lack of technology has always been an issue of concern in classrooms. One of the implications of the study is that with the modernisation of almost everything around the world, the educational system needs to immediately reconsider the school facilities by not only drawing up policies and plans to use technology in language classrooms but also by providing monetary support. The third factor mentioned by the students in the study as an influential demotivational cause was related to the teachers' competence, teachers' behaviour, and their teaching method and style. This is quite in line with the findings of many other studies including Arai (2004), Dörnyei (2001a), Heidari and Riahipour (2012), Muhonen (2004), Miyata et al. (2004), and Oxford (1998, as cited in Dörnyei, 2001), which highlighted the role of teachers as demotivators in the English classes. As a factor commonly stated by all the above mentioned studies, teacher's competence can have both a motivating and a detrimental influence on the students' motivation. Teacher's domain-specific knowledge and beliefs would predict the students' learning in that domain and their motivation (Kunter, Klusmann, Baumert, Richter, Voss & Hachfeld, 2013). Those teachers who still adopt outdated methods and fill the students' minds with strict grammatical rules, may never get favoured by students and may soon affect their interest in language learning. Teachers' instructional quality also affects the students' outcomes to a great extent. High autonomy supportive teachers bring about higher intrinsic motivations to the students. Controlling teachers, on the other hand, reduce the students' motivation by not paying attention to their needs, focusing only on content coverage, and handling classes in a teacher-centred way. Students of low-involvement EFL teachers will soon get frustrated about the whole process of learning. Teacher's behaviour and class management is perceived by students as the sign of professional adequacy. Teachers who behave coercively by adopting punitive discipline strategies will distract the process of learning by threatening students' emotional and consequently academic well-being. Demotivated students might reflect their negative state in the form of reduced homework completion, less concentration, fewer interactions, and poorer attendance, all of which will subsequently result in students' dropping out of the course or abandoning the idea to go on with their language learning outside the curriculum. A teacher seeking to avoid being demotivating should be instructionally and emotionally supportive, providing opportunities for students to respond, interact, and contemplate, while giving them a sense of achievement to build on. Kennedy, Ahn and Choi's (2008) "bright person hypothesis" (BPH) asserted that "the best teachers are bright, well-educated people who are smart enough and thoughtful enough to figure out the nuances of teaching in the process of doing it" (p.1248). Their argument presents the idea that teaching is a highly demanding and complex task and only those qualified enough should risk entering the field. Oxford and Shearin (1994) proposed five main motivational roles for the ESL teachers, including (a) figuring out learners' incentives for learning the L2; (b) helping students set challenging but realistic goals; (c) discussing the benefits of learning the L2; (d) creating a safe and non-threatening teaching environment; and (e) helping students build high intrinsic motivation. The fourth demotivating factor identified in the present study was students' lack of interest in language learning, due to different reasons like not having enough motivation or the use of non-communicative methods at schools. Our findings in this regard are in line with Sakai and Kikuchi (2009), who concluded that the use of non-communicative methods by teachers was a feature unique to their study, in comparison to Dörnyei's (2001a) nine-category study on demotivation. Students' apathy and lack of interest are serious challenges to maintaining their engagement in the academic process. If students are not provided with genuine reasons to be engaged with language learning, they will soon be faced with motivation zapping problems. They might feel what they learn will not be relevant to the context of their lives. It is the responsibility of EFL teachers to combat student apathy through communicative and affective teaching that gives them a more favourable academic atmosphere. Malouff (2008) introduced 12 categories through which teachers can enhance motivational teaching and improve students' desire to learn, including establishing a positive relationship with students, using engaging teaching methods, using an appealing teaching style, and giving them motivational feedback, to name a few. The fifth demotivating factor detected both in the quantitative and qualitative phases of our study dealt with the class materials. As asserted by the participants, uninteresting reading topics, long passages and outdated material led to their loss of interest in English learning. This accords with the results of studies by Al Kaboodi (2013), and Aydin (2012), which deemed irrelevant class materials responsible for the students' fading of motivation. Teaching materials form an important part of most English teaching programs. Most schools, however, build their curriculum on societal norms rather than giving students a choice to learn what they think is relevant to their needs. So, the motivation to learn decreases dramatically when the learners learn something they don't find relevant. Lack of unity, lack of coherence, and imbalanced activities presented in the books are some other sources of demotivation among learners. Good teachers can make use of a diverse range of materials to support their teaching, from textbooks to videos or online materials, or make materials as relevant as possible to the students' needs and interests. Many teachers, however, use the impoverished materials proposed in the national curriculum with no use of extra resources available to compensate for the decontextualised, unattractive materials presented in the common course books, as they give them a sense of security and a clear progression plan. Unintentionally, then, they help speed the process of student demotivation. Finally, concerning the last demotivating factor, classroom environment and characteristics, the present study shows that the number of students in the class, the role of classmates, and unfair treatment and peer comparison by the teacher could demotivate learners to a large extent. In line with other studies conducted on demotivation (Dörnyei, 1998, 2001a, 2005; Farmand & Abdolmanafi Rokni, 2014; Heidari & Riahipour, 2012; Kichuki, 2009; Mahbudi & Hosseini, 2014; Muhonen, 2004), the results indicate classroom environment, teacher behaviour, and class size as factors which could lead to the learners' loss of motivation in learning a foreign language. Concerning class size, the National Council of Teachers of English, USA (2015) published an online article outlining the importance of class size, stating that students in smaller classes show an improvement in academic performance, better student involvement, and also academic long-term success in life. Concerning teacher behaviour, teachers should encourage peer support and create a cooperative and friendly atmosphere in the classroom rather than comparing students with one another and creating unhealthy competition and a feeling of inferiority among them. The present study aimed to identify the major demotivating causes which may influence the performance of Iranian language learners at university level. As the findings of both qualitative and quantitative data analysis suggested, six main themes emerged as the basic demotivators. These included: (a) teacher's competence, teaching method and behaviour; (b) lack of success; (c) lack of enough instructional facilities; (d) class content and material; (e) class environment; and (f) lack of interest. As it is not such an easy task to give learners enough initiative to step into the long process of language learning, once they do, we have to perform our best to avoid their incentives diminishing. That is why the construct of demotivation is gaining more and more popularity among the researchers nowadays and demands due attention, especially within EFL contexts like Iran, where few, if any, opportunities are available to the learners to get motivated through the use of language in authentic contexts. More research needs to be carried out on the issue regarding the four language skills in isolation while targeting various age groups with different proficiency levels. Gender-oriented research on demotivation may be another future possibility as different gender types might exhibit differences in terms of their demotivational determinants. Arai, K. (2004). What 'demotivates' language learners? Qualitative study on demotivational factors and learners' reactions. Bulletin of Toyo Gakuen University, 12, 39-47. Ayako, H. (2004). Student demotivation in the foreign language classroom. Takushoku Language Studies, 107, 119-136. Dörnyei, Z. (2001a). Motivational strategies in the language classroom. Cambridge: Cambridge University Press. Dörnyei, Z. (2001b). Teaching and researching motivation. Harlow: Longman. Dörnyei, Z. & Ushioda, E. (2011). Teaching and researching motivation. Harlow: Longman. Farmand, Z. & Abdolmanafi Rokni, S. J. (2014). An exploration of university students' perception of demotivators in an EFL context. International Journal for Teachers of English, 4(1), 11-18. Kennedy, M. M., Ahn, S. & Choi, J. (2008). The value added by teacher education. In M. Cochran-Smith, S. Feiman-Nemser & J. McIntyre (Eds. ), Handbook of research on teacher education (pp. 1249-1273). New York: Macmillan. Miyata, M., Shikano, M., Ishida, T., Okabe, J. & Uchida, M. (2004). Seito ga tsueketa eigo no tsuuinbo [Students' evaluation on teachers]. Eigo Kyoiku, 53(8) 58-65. Pallant, J. (2011). SPSS survival manual: A step by step guide to data analysis using SPSS for Windows. McGraw Hill: Open University Press. Tsuchiya, M. (2006a). Factors in demotivation of lower proficiency English learners at college. The Kyushu Academic Society of English Language Education (KASELE), 32, 39-46. Authors: Dr Behzad Ghonsooly is a professor in the Department of English, Ferdowsi University of Mashhad, Iran, and by courtesy in the Psychology Department of Florida State University. His main research interests are language testing, English for special purposes, and translation studies. Tahereh Hassanzadeh is an EFL teacher and a PhD candidate in TEFL at Ferdowsi University of Mashhad, Iran. She is keenly interested in conducting action research in the fields of psycholingusitics and language teaching and learning. Laila Samavarchi is an EFL teacher and a PhD candidate in TEFL at Ferdowsi University of Mashhad, Iran. She is highly interested in working in fields such as psycholinguistics, sociolinguistics, and discourse analysis. Seyyedeh Mina Hamedi (corresponding author) is an EFL teacher and a PhD candidate in TEFL at Ferdowsi University of Mashhad, Iran, whose main research interests are psycholinguistics, discourse analysis, and language teaching and learning.